The challenging economic environment in the aftermath of the Great Recession has turned up the pressure for brands to create advertising that will justify the investment… and the continued advertising budget. 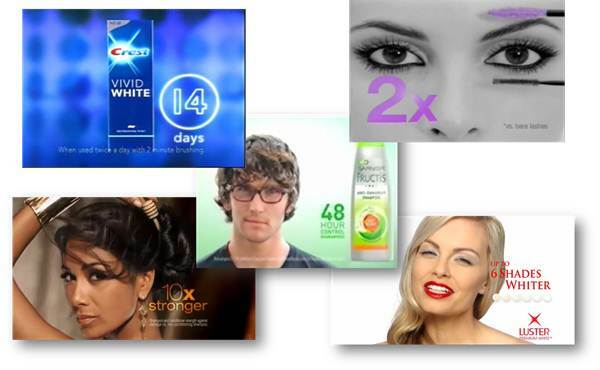 To meet this challenge, one advertising format brands are turning to is the product benefits ad. For this reason we have put together a four part series which shares proven techniques for creating product benefits ads that sell. Part one of this series examined tactics for ensuring that the advertised product actually remains the main character of the advertisement, while part two discussed some methods that can be employed to characterize the product as a hero in the lives of consumers. But how can we ensure that the story of our hero will end in the triumph of persuasive advertising and not the tragedy of wasted media dollars? It is often said that the devil is in the details, and the details that we choose to describe our product and its benefits can make the key difference in making our appeal to the consumer interesting, believable and convincing. Part 3: Speaking in a Convincing Voice. The third key essence of product benefits advertising is “speaking in a convincing voice”. MSW●ARS research has found that it isn’t enough to just get your advertising in front of consumers. What you say and how you say it is critical. In fact, our research has shown that advertising quality is four times more important than media weight in explaining changes in brand sales as the result of television advertising. Creative matters in a big way, starting with the basic selling proposition and continuing through to the executional details and copy points that provide reasons to believe the brand’s claims and ultimately to buy the product. David Ogilvy is famously quoted as saying, “In my experience, the most valuable use of research in the creative process is in testing promises. If your promise is strong, your advertising will sell. If your promise is feeble, your advertising won’t sell.” Ogilvy recognized the primary importance of the underlying selling proposition in the development of sales effective advertising. The upstream research to identify a compelling selling proposition can pay enormous dividends down the road. A long-term MSW●ARS research study verified what Ogilvy learned from his years of experience. These findings vividly illustrate the importance of arming our product with a strong promise in order for it to speak to consumers in a convincing voice. In order to successfully translate our strong selling proposition into advertising that sells, we need to execute it in a way that builds confidence among consumers that our promise is real by providing believable and persuasive reasons to believe our over-arching proposition. While there is any number of ways that this can be achieved, the following approaches have proven associations with effective advertising. Quantifying a claim with a specific number or amount can provide added credibility in comparison to vague claims such as “more” or “faster”. It’s possible that providing this type of specificity provides a suggestion of more thorough research backing the claim, hints that the brand has nothing to hide, and catalyzes a more specific expectation in the mind of the consumer. Research has shown that the most effective type of quantification is the closure claim – specifying the time until a benefit will be realized by the user. Examples would include “in just 10 days” or “after just one use”. But any kind of numerically quantified benefit (such as “80% more volume”, “times stronger”, “lasts for 20 hours”) has been shown, on average, to boost an ad’s persuasiveness. Seeing is believing. Advertising is a visual medium and brands can take advantage of this to bring their claims to life, offering compelling and convincing proof through the use of a visual demonstration. A demonstration of the product in use, utilizing either the actual product or an analogy when more practicable, can demonstrate how the product works, highlight important features and illustrate superiority when done as a side-by-side with the competition. A demonstration of the results of using the product, again either actual or by analogy, illustrates the outcomes that can be achieved by using the product. 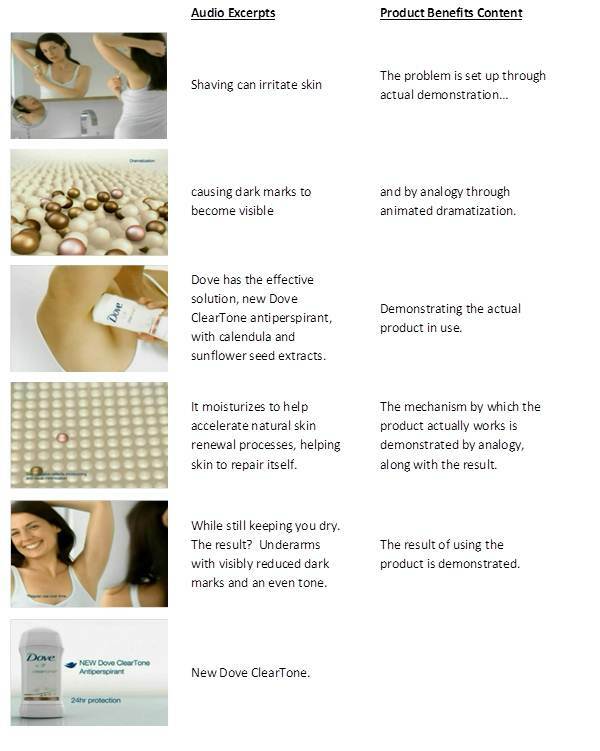 This ad for Dove ClearTone Antiperspirant intertwined an actual demonstration with an animated dramatization to effectively illustrate the problem, how the product provides an effective solution and the end result of use. Nearly the entire length of the ad was devoted to these demonstrations, resulting in an above norm execution for the brand. Another way brands can add credibility to claims is through the use of ingredients information. Some ingredients may bolster claims through being widely known for efficacy (fluoride in toothpaste). Additionally, brands may use ingredient information not only to imply efficacy but to also create associates they wish to build with their product. 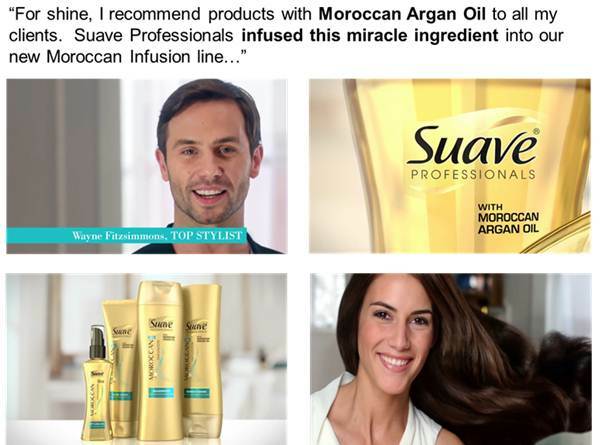 Some examples would include the exotic (“with Moroccan Argan Oil”), the wholesome or natural (“mountain spring water”), the reliable (“Intel inside”), the luxurious (“rich Corinthian leather”) or the scientific (“cutting edge technologies”). With our advertising we wish to creatively associate consumer insights with a benefit that our product delivers. The more unique the insight, the simpler the advertising can be and the greater the probability of success. If an ad’s insight(s) are weak, more weight falls on execution to save the day, but as we saw earlier, execution has little chance of salvaging a weak basic selling proposition. Attempts to use multiple key ideas with the hope that something sticks are likely bound for failure. Research shows that the more key ideas that are included in an advertisement, the lower the communication level is, not only for each individual idea but also for key idea communication overall – with the decline being rather steep. Effective product benefits advertising should be highly disciplined in terms of supporting the over-arching selling proposition. Every copy point and executional detail should have the purpose of providing support focused on the communication of our basic proposition – superfluous information or execution should be avoided. Product attributes should only be introduced if they are linked to the benefit we are promising our product will deliver. Advanced market research justifies its existence in terms of its ability to discover the most efficient sales points for a particular brand. This is the real core of advertising and its most challenging problem area.